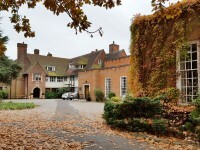 Beaumont Hall is located to the south of Leicester City Centre and the main University Campus, in Oadby. Stoughton Drive South is accessed off the A6 Leicester Road, close to the City Outer Ring Road. Bus routes 80 and 80A stop on Stoughton Drive South outside the entrance to this Hall. 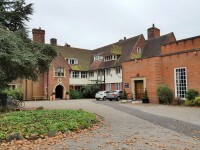 These routes link this accommodation to the main University Campus, and the 80 bus also goes to the City Centre and the Station. Leicester Station is located on the south side of the City Centre, just off the Inner Ring Road. Stoughton Drive South can be reached from here using the 80 bus. Leicester is on the London - Sheffield and the Birmingham - Stansted lines. 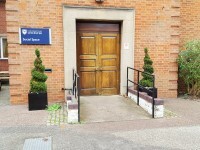 For more information about getting to the University Main Campus, please see the Getting To Leicester page on the University website. For more details regarding buses in Leicester, please see the Arriva website. For more information regarding trains to Leicester, please see the National Rail Enquiries website. To see more information on AccessAbility Centre please click here (opens new tab). Telephone Number: 0116 252 5002. To see more information on Undergraduate Admissions please click here (opens new tab). Telephone Number: 0116 252 5281. To see more information on Taught Postgraduate Admissions please click here (opens new tab). Telephone Number: 0116 252 5381. To see more information on Research Postgraduate Admissions please click here (opens new tab). Telephone Number: 0116 229 7652. Telephone Number: 0116 252 2428. The car park can be used by anybody. 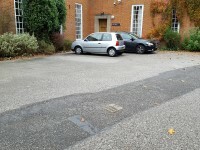 The car park is located in front of the building. 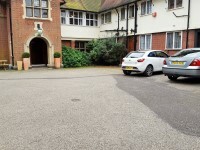 There is/are 0 designated parking bay(s) within the car park. 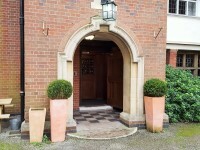 You are on Outside Access (Social Space Entrance). Skip to the next section. This information is for the entrance located off Stoughton Drive South, at the front of the building. 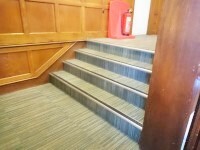 The width of the ramp is 144cm (4ft 9in). 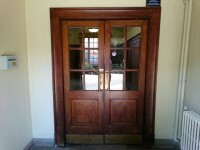 You are on Outside Access (Student Access To Accommodation). Skip to the next section. This information is for the entrance located off Stoughton Drive South, in the front left corner of the building. 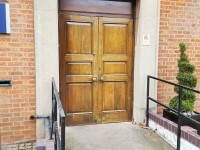 The card reader/lock is not in a suitable position to allow wheelchair users to gain access. 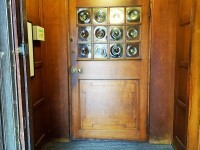 The width of the door opening is 100cm (3ft 3in). The key card reader is 140cm high. This building does play background music. 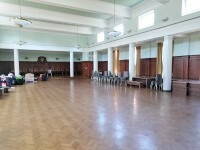 Music is played in the music room. You are on Games Room. Skip to the next section. 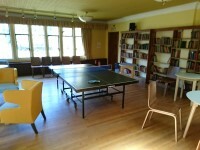 Access to the Games Room is via a single door, 82cm wide. 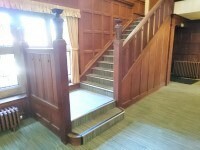 There is level access to and throughout the game rooms. There is some seating with armrests on both sides available. 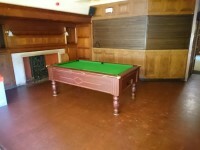 All table's and chairs are movable. You are on Music Room. Skip to the next section. 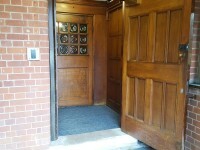 Access to the to the Music Room is via a single door, 89cm wide. 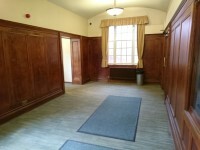 There is level access to and throughout the Music Room. 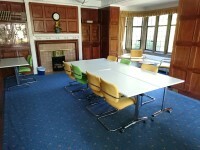 There is a range of seating available in this room, some with armrests on both sides. 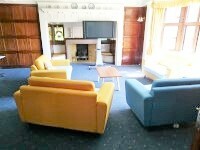 The establishment provides 0 accessible accommodation facilities with an ensuite and/or separate accessible bathroom. 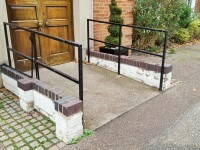 The accommodation does not provide other auxiliary aids for people with mobility impairments. 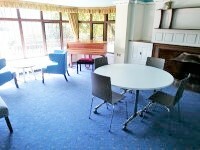 Assistance dogs are welcome to stay with residents in standard rooms. 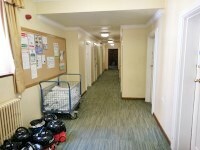 The area(s)/service(s) on the floors which are not accessible is/are student rooms. You are on Accessible Toilet (Male Accessible Toilet). Skip to the next section. This accessible toilet is located right off the main corridor next to the male standard toilets. 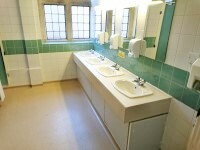 There is also an accessible toilet located within the female standard toilet. 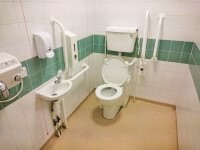 The dimensions of the accessible toilet are 147cm x 196cm (4ft 10in x 6ft 5in). 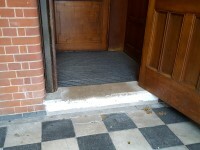 Floor manoeuvring space is not clear in the accessible toilet. The toilet surveyed is located to the right of the main corridor. 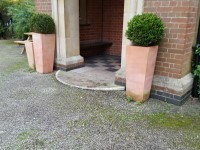 The standard toilet surveyed is approximately 13m from the main entrance.